Las Vegas is the home to many of the most coveted conventions that inhabit our fair city year round. Many industries are represented and business associates flock from all around the world for conventions such as the Consumer Electronics Show or Magic. There is little doubt to the magnitude of these events and the difficulties regarding getting thereto the convention will impose. Any experienced convention goer will tell you that airport shuttles (though cheep) are a time-sucking nightmare, taxi-cabs are one gamble you do not want to chance with in Vegas, and city buses are best left to locals or those who have no where important to be. Efficient travel that is reliable are the crucial aspects of what you need on your visit. Getting lost, having reservations that do not pan out, and/or being late are not part of your plans and with MW Travel Vegas they never will be. Where our sedans may not accommodate your larger group, our convention shuttle buses will. With lavish comfort for up to twenty passengers, your group will be taken wherever they need to go even if that requires multiple locations. While airport shuttles make frequent stops that have nothing to do with where you need to go and taxicab drivers are notorious for taking longer routes, you can put your trust in our experienced drivers who have the sole purpose of ensuring your comfort, safety, and arrival on time. We even offer extended services for your entire group whether you all want to experience the truly unique nightlife Las Vegas has to offer with our world renowned shows, exceptional celebrity chef restaurants, nightclubs and lounges that encompass any interest you may have, perhaps you’d like to take in the sights and enjoy one of our drinks packages, even our gentleman's club tours are available upon request. You need simply let us know how we can assist you and we will do the rest. 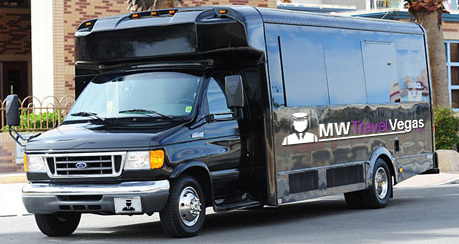 MW Travel Vegas will make certain that your worries are addressed and your travel expectations are beyond taken care of.